St Martin's Day is celebrated on the 11th. November. In this section, pupils learn to say the date in German. Saying and writing the date in German can become a regular part of your classroom routine. 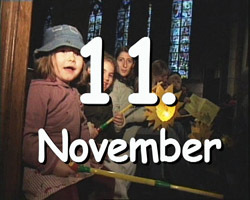 Children can also find out more about celebrations in the German calendar. This day celebrates the anniversary of the formal end of Germany's division into tow separate countries, known as "West Germany" and "East Germany" which were re-joined in 1990.